The original LS was launched 30 years ago and was ground-breaking at the time. The executives at Toyota wanted to launch a brand to take on the Germans; the LS was a direct competitor to the S Class. The LS was Japan’s answer to luxury motoring, it was not only bullet proof and extremely reliable, but they showed the competition how to deliver excellent levels of customer service. Lexus took America by storm and they went on to dominate the sales charts outselling home grown manufacturers. It took a bit longer for Lexus to make inroads in the UK; the LFA was a real hero car for the brand. Along with its new styling direction I think Lexus, despite its reliability and innovation, the LS was never really a big sales competition for the S class. At its peak in 2007, Lexus only sold 400 cars and Mercedes managed to shift 2500 S Classes. I think one of the stumbling blocks for sales has been the lack of Diesel engine, with the recent Diesel backlash Lexus may have the advantage with their petrol engines and Hybrid technology. The latest 5th Generation car isn’t going to be a massive seller for Lexus either, they are looking to sell 100 cars this year and I’m sure they’ll sell those with no problems at all. The 3.5lt V6 engine produces 295bhp and with the two electric motors which add another 60bhp, the car gets to 60mph in 5.4 seconds and it should return careful drivers nearly 40 mpg. There are four trim levels to choose from and even the entry level cars get 20″ alloys, triple led headlights, sat nav, 20 way power adjustment, dual zone climate control and 12 speakers. The next trim level is luxury; cars are available in either rear wheel drive or four wheel drive, heated and ventilated seats, 23 speaker Mark Levinson sound system, a climate concierge which uses infra-red technology to monitor each passengers body temperature and it also takes into account the sunshine to keep the interior at the perfect temperature for all occupants. The next trim level is the F sport and this gives the car an even sportier look, the front grill gets an upgrade and gloss black detailing on the side skirts, boot lid and alloys. Four wheel drive models also get rear wheel steering. The range topping model is the appropriately named Premier. This car is only available in four wheel drive and it’ll account for 45% of sales. Passengers in the rear have Shiatsu massaging seats and one of the rear seats also has an ottoman feature. The front seat moves forward which allows the rear seat to recline and the lucky passenger has a meter of legroom. Anyone who has been fortunate enough to travel first class or turn left rather than right would appreciate the lengths Lexus have gone to make the car feel luxurious. The car really has a business/first class feel to it. Lexus’s safety system keeps the car in between the white lines on the road, if they aren’t there for whatever reason the cars radar watches the car in front. The only downside is if the car ahead overtakes the car does the same. A sophisticated passenger advance system can help swerve and brake to avoid a collision. A reversing monitor can also tell the difference between pedestrians and static objects so it will intervene if it thinks you are going to hit someone. 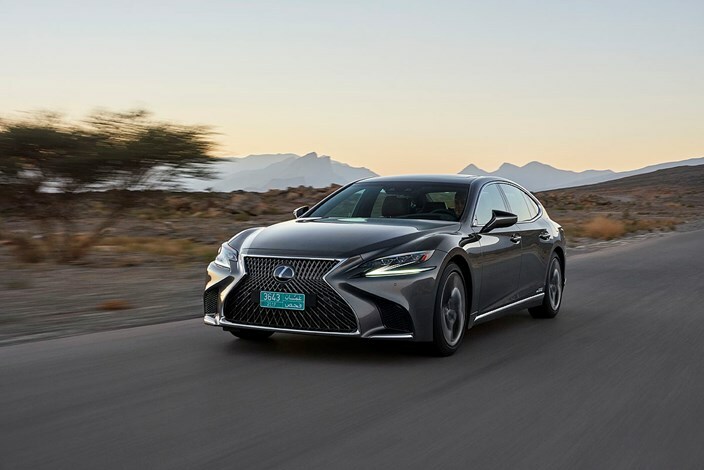 Lexus aren’t chasing the chauffeur market so don’t expect any discounts, the LS should retain at least 53% of their value after three years. On the road the car isn’t quite as comfortable as the S Class although the air suspension does a great job of smoothing out pot holes. The car isn’t as dynamic to drive as the 7 series and the extra weight from the batteries doesn’t help at all. It’s very refined at speed and that’s partly down to the noise cancelling technology however at motorway speeds there is a bit of wind noise. To make swift progress you have to plant your foot firmly on the accelerator. I preferred driving the car in sport plus mode which helped give a much sharper throttle response. Japanese craftsmanship has come a long way and the car’s interior is beautiful, hand pleated fabric door panels and cut glass inspired door inserts are a £7600 option. The cars leather and switchgear just scream quality and it’s on par with the S Class. The Lexus infotainment system is also very good, my only complaint is the mouse style controller is really hard to use compared to a dial. The massive head up display has all the information the driver needs. Another great feature was the all-round cameras, they really help when parking the car and the quality of the image is very impressive indeed. The boot space isn’t the best in its class and it’s even beaten by the ageing Jaguar XJ, probably due to the batteries in the boot. The LS is priced from £72,595 – £97,995 and I do think anyone looking for a premium saloon that will be quite a rarity on the road should get along to Lexus and buy one as you won’t be disappointed at all.